"You can smell the crazy coming off them..."
The folks over at Declination have put together a primer for SJW speak. Some examples are below, more at the link at the bottom. You are a Racist!” You’re white. And probably male, cis-gendered, and straight. Remember, all white men are racists, and any accusation of racism is prima facie evidence of guilt. Progressive white men can be exempted by proclamation by the SocJus community. But this exemption can be revoked at any time, in which case you revert to being a racist. “You’re a Misogynist!” You’re white. And probably male, cis-gendered, and straight. Remember, all white men are sexists, and any accusation of sexism is prima facie evidence of guilt. Progressive white men can be exempted by proclamation by the SocJus community. But this exemption can be revoked at any time, in which case you revert to being a sexist. “You’re an Islamophobe!” You have common sense, which is, of course, a violation of accepted SocJus norms. The only sense you are allowed to have is fed to you by the media. When the media tells you Islam is good and Christianity is evil, you must accept this with no further discussion or demands for evidence. “You’re a Homophobe.” This one has a bit of nuance to it. This is really code for being a cis-gendered heterosexual who failed to praise homosexuality with every second breath. However, any homosexual (Milo, basically) who departs from the narrative can be safely attacked. Indeed, failing to insult a conservative homosexual is grounds for immediate expulsion from SocJus and is, paradoxically, proof of homophobia. For the uninitiated, Social Justice Whiners are the perpetually offended and usually of the leftie persuasion. As always, your friendly neighborhood Lord High Inquisitor of Capitalism (and literally-Hitler) is always searching for more translations. When we passed heading southward said trailer was still very much attached to the boat whilst doing "dead ants" as a package. As shown in the picture below. From the picture, more a mechanical failure of the outer stub axle with subsequent detachment of the trailer from the towing vehicle. The repeater would do well to inspect the picture closely before interviewing her keyboard next time. 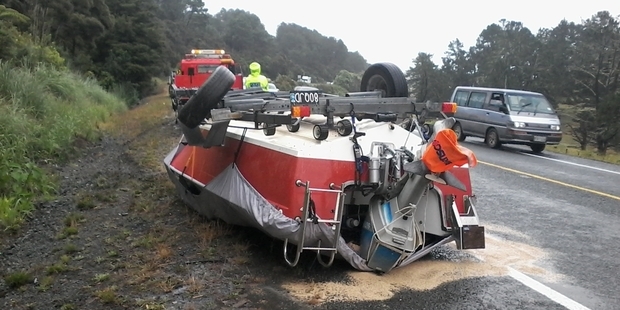 About 11.50am on Saturday a car flipped on its roof on State Highway 1 on the southern side of the Brynderwyn Hills. Three occupants climbed out of the car windows and one person had to be cut out. Mr Atiq said there were no injuries. The Brynderwyns crash blocked the southbound lane of SH1 and caused a backlog of traffic with many holidaymakers on the road heading home. Does she want a picture of through traffic clearance mismanagement at the above Brynderwyn SH1/SH12 incident? 3x major lines of holiday traffic being let through at barely 10 vehicles a time when the slightly damaged vehicle could have been towed/pushed off the wide shouldered road onto the verge and dealt with. Not left on the road whilst traffic was blocked 5 km plus in each direction. Management of accident sites in NZ is non-existent. Probably waited an hour or so for the duty bone wearer to arrive and pronounce the road again fit for traffic.